Do foxes eat cats? Will my dog get along with a pet fox? Can I have a pet skunk AND a pet fox? I hear these questions a lot, and no two fox owners will give you quite the same answer, as no two foxes are alike. However, there are some basic rules of thumb that can increase the odds of a pet fox blending in well. It's never advisable to leave a fox and another pet alone together, especially when they're just starting to get used to each other. Even if both animals are friendly, play can get a bit too rough and things can escalate. I know of more than one case where a fox and another pet who had always gotten along in the past were left alone together, and one or both were seriously injured when a fight broke out. 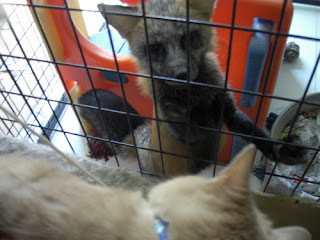 Don't try to introduce a fox to a caged pet or "pocket pet". Just don't. When your fox looks at your pet hamster/lizard/parakeet/sugar glider it doesn't see a friend, it sees food. Attempting to introduce a fox to a pocket pet will only end in tears, and it won't be the foxes fault. Although not always possible, this can be a huge step towards pets in the house at least coexisting. It's much easier for an established full-grown cat to teach a fox kit to respect it's space than it is for a kitten to teach an adult fox the same thing. If introducing a new pet will make major changes to an established pets life (i.e. not allowed to go in a certain room, less attention, etc.) make those changes BEFORE you bring the new pet home, so the old one will not associate the restriction of it's freedom with the new arrival. Animals rely a lot more on smell than we do, and an unfamiliar scent can cause a great deal of stress. Before introducing a fox to another pet, get them both used to the other one's smell. One of the easiest ways to do this is to take the blanket from one animal's bed and trade it with the other animal's blanket. This will allow them to get comfortable with the other one's scent ahead of time, so that when they do meet it won't be a completely "unfamiliar" animal. Whenever possible, introduce animals on territory that neither one "owns". If neither animal feels like it owns an area and has to protect it, things are less likely to go south. #7. Let Both Animals Have an "Escape Route"
Especially at first, both pets must be able to get away from the situation if they're starting to feel stressed. If the fox or the other animal feels cornered, things can turn nasty quite quickly. The easiest way to do this is to leash both pets, and have a responsible adult have a hold of each one. Make sure that each one can retreat out of reach of the other one's leash. For those of you readers who are from multi-pet households, how did you introduce your animals at first? What techniques have worked for you? I've always found it's best to get both animals as babies, and just have them grow up together. These are nice tips, it reminds me of the things we did when we introduced our first cat to our rabbit, and the second cat to the first one. As our first apartment was small and the bathroom was the only room with a door we used it to separate the animals at first. As there were small holes for ventilation the animals could smell each other without contact. The next step was opening slightly the door so they could see but not reach each other. I really hope to get a fox someday, they always fascinated me and I love how they're a sort of mix between dogs and cats. My girlfriend would like to get a border collie, I wonder if it would be best to get both at the same time and grow them together? Thanks for making this blog anyway, it's really great! My Cat does NOT like other cats - even tiny kittens (like 3 weeks old) get her hissing! But has always been indifferent and sometimes friendly towards my mums dogs. Now they both respect each others space and Angel (cat) forgives Kiara for occasionally clambering over her! They will eat out of the same bowl if kiara isn't too interested in the food! Otherwise angel will back of until kiara's lost interest! Hope this is of intest to some! Introducing pets is always a little difficult, usually when introducing new pets to the (many) pets in our house, we would bring the new one and allow them to have a spare room to themselves for a few days. Then, take them out into a room the family pets hang out in, and switch them up. So, new critter in old room, old critters in new room. Trading smells and all that. And for introducing them, we would do it one on one for the pets, supervised of course :) introduce each old pet to the new one, then let the new one learn to blend and get along! Anon, please do not introduce a ferret to a fox. A ferret is a "caged animal"; they might be bigger than a hamster, but caged animals and foxes should just NOT interact. Just because people keep ferrets in cages does not make them a "caged" animal. Ferrets and foxes are for the most part of the same temperament and diet. They are both predators and carnivores and if introduced correctly will get along fine. Having the same temperament and diet does not make them the same. A fox is unlikely to view a ferret as anything but food. Only a complete moron would try to introduce the two. Both being carnivores doesn't mean they'll get along--it makes it a lot LESS likely, actually. I have a fennec fox and used to have 2 ferrets till they pasted recently at around 8 yo. The fox tried to be friends and 90% of the time they were out together they were ok, but it was the ferrets that picked the fights for the most part. The 3 story ferret cage was on a raised shelf in the fox room (which is an entire spare bedroom). The fox would sleep on the shelf near the ferret cage, and other then some barking there was no issue with the ferrets/fox while tbe ferrets were caged. When out, the elder and larger of the 2 female ferrets would especially try to establish dominance. I caught her dragging my full grown fennec into another room. The fox had a "WTF is happening look on her face". Occasionally the ferrets pushed her to far and she would go after them, but I can't remember her ever breaking the skin, and considering the day I picked her up at 8weeks old she punched through my finger like it was paper I'm pretty sure she was holding back and mostly just scolding the ferret. The ferrets however did draw blood once or twice and at that point the ferrets were getting elderly but still onrey enough to pick a fight, so I gave up and kept them completely separate, and most of the time their free roam times were seperate, with just a few minutes of overlap. So while I think it is possible, the ferrets being to old and having claimed all the territory and the fox could never win them over. But the fox continued to look for them even after they passed, she loved following them and watching them and would always lay down in front of them submissively but then they'd bite her and piss her off. So from my experience it is certainly possible to have a ferret friendly fennec if the ferret will allow it, but they should probably be raised together and ALWAYS SUPERVISED. The biggest hurdles are going to be the size/speed differences, at some point in their life one will have a distinct physical advantage over the other and one of them establishing dominance without the other reacting to violently is problematic. While a full grown ferret is pretty tough a fennec is usually bigger and much faster and if sufficiently provoked or just gets to excited could kill the ferret. And an adult ferret could easily kill a fox kit. IMO no matter how well you think you've socialized them you should never trust a ferret or a fennec to be alone together, or either of them with a small child. P.S. I also think anything less then a walk in closet or spare bathroom is to small for a Fennec unless 95% of its waking life will be free roam (ya good luck with that). Fox/ferret guy again... Let me add that my Fox is now about 7 and the ferrets were elderly, I had them together about 5.5-6 years of the time so I'm not a new owner. Also a large male ferret could conceivably be a real threat to any Fennec. I don't know if the equality would ease tensions or be more dangerous. My gut says your best shot is a female ferret raised with the fox that eventually wants to mother the fox as it matures and the fox letting it... or vice/versa. And again... SUPERVISE ALWAYS. Both these animals IMO are not domesticated enough to warrant the same trust a dog or cat might be given, no matter how well behaved they seem to be. Never trust your exotics... chances are you, they, and/or someone else will pay for that mistake eventually. I have a cat and a house rabbit (she doesn't live in a cage, just goes wherever) and we had the rabbit first. When we got the cat they were both mature so we introduced them in a room the rabbit hadn't gone yet, they just circled each other around the room for a bit until the rabbit that she was ready to play and scared the crap out of the cat. He was scared of her for months! They have finally, after lots of smelling and playing with the same toys, and lots of pee! gotten use to each other. They play with each others toys and nap together all the time. I have a question though, (it might sound really stupid) My rabbit I think would be considered a cage animal, but considering she doesn't usually live in a cage would that change the way a fox would see her? That's what happened with the dog I use to have. He would try to get her when we kept her caged, but when she started being out more he stopped. Our rabbit had never seen a ferret. Ferrets eat rabbits in nature (though mine had only ever eaten kibble) and the rabbit was NOT happy that the ferret was outside her cage. She would thump her ferret on the bottom of her cage. Just because food isn't canned doesn't make it not food. Foxes eat rabbits. Point blank. Your rabbit would likely die of fear just having it near it's natural predator. Natural instincts. Do male dogs get along with male foxes?